The clouds produced by five suborbital NASA rockets that launched on March 27, 2012, from the agency's Wallops Flight Facility in Virginia were reported to be seen from as far south as Wilmington, N.C., west to Charlestown, W. Va., and north to Buffalo, N.Y.
Update: The NASA sounding rocket blasted off at 7:07 p.m. EDT (2307) GMT on Wednesday. A NASA suborbital rocket launch Wednesday evening (Oct. 7) is expected to produce glowing clouds high above Earth, and you can watch all the eye-catching action live online. Weather permitting, a Black Brant IX sounding rocket is scheduled to blast off from NASA's Wallops Flight Facility in Virginia at 7 p.m. EDT (2300 GMT) Wednesday and deploy colorful clouds of barium and strontium that will be visible to observers throughout the mid-Atlantic and northeastern United States. But people all over the world can watch the launch and see the clouds live on Space.com, thanks to a webcast provided by NASA TV and the Wallops center. The main goal of Wednesday's launch is to test the performance of the two-stage Black Brant IX, which will be flying with a reformulated motor, NASA officials said. But the mission also serves to try out a number of technologies, including newly developed lightweight materials and novel payload-ejection systems. 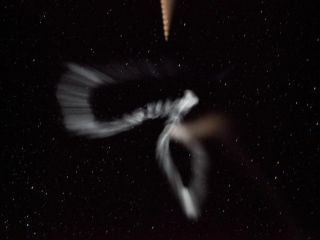 One such ejection system is designed to deploy vapor clouds, which researchers use to study winds and other phenomena in Earth's atmosphere. And that's what will provide the sky show during Wednesday's liftoff. This map shows areas of North America where a sounding rocket launch should be visible on Oct. 7, 2015. The barium and strontium will be released at an altitude of 130 miles (209 kilometers). The clouds should begin appearing about 6 minutes after launch, according to Space.com skywatching columnist Joe Rao. "The barium-strontium mixture produces a cloud with a mixture of blue-green and red color. The blue-green part is neutral, i.e., not charged. Strontium is used to enhance the visibility of the neutral flow," NASA officials wrote in a statement Friday (Oct. 2). "The amount of barium and strontium used in the test is much smaller than that used in a typical July 4 fireworks display and poses no hazard to the community," they added. Wednesday's launch was originally scheduled for Tuesday (Oct. 6), but bad weather forced a delay. The launch window extends through next Monday (Oct. 12). Editor's note: If you capture an amazing image NASA's rocket launch that you would like to share with Space.com and its news partners for a story or photo gallery, send photos and comments in to managing editor Tariq Malik at: spacephotos@space.com.